The upper section of Larry Canyon, where it cuts through the Navajo Sandstone, is a cool little journey down into the stone. One moment you're walking across the desert; the next, you're stemming through a narrow slot. Larry involves a lot of downclimbing and a bit of rappelling. There is a strenuous slanted narrow slot that really works you - bring as small a pack as possible. Gloves are highly recommended. The place is lovely, offering up a smorgasboard of beautiful narrows and soaring orange walls. After many hours, the intrepid canyoneer pops out into the land of the living. Hiking down the now-wide canyon, the exit is found after about an hour - a low-angle V-groove used by the Desert Bighorn Sheep to exit the inner canyon. A brief climb leads to the rim and a dirt road. Larry Canyon itself continues many miles down to the Dirty Devil river. Another interesting set of narrows is said to exist where Larry drops through the Wingate sandstone. Technically, this route is "Upper Larry". Wading up to waist deep can be expected; bring drybags for your gear. Lots of strenuous narrows, quite a few downclimbs, and a few rappels. Can require swimming in narrow slots. Natural anchors required. This is a long day in a remote location. As with most Roost journeys, getting there can be quite an adventure itself. From Highway 24, drive 24.2 miles to the BIG TEE. Turn south (right) toward Hans Flat, and follow the road 7.1 miles to the Little Y. Take the right fork toward Ekker Ranch, and follow this road 6.5 miles to the vicinity of the Ekkers Ranch ("Ekkers Ranch Turn"). The ranch is still in use, and there is no need to go through there. At 6.5 miles, continue .5 miles to a crossing road. Turn right, and travel .75 miles to where the road crosses a wash. Park here in any of several places. There are three washes that cross the road, and any of them will do. They all lead to the same place. If you have another car, spotting a car out on the ridge can be a good idea. From "Ekker's Ranch Turn," continue .5 miles to the crossing road, and go STRAIGHT. At .5 miles, turn sharply left (the main road) and follow this another 2.15 miles to a slickrock area (the head of Alcatraz, a good place to camp). Continue west 1.5 miles and park next to a juniper. If you carry a GPS, mark the car. Follow the wash west. After half a mile, the floor suddenly drops away. Carefully climb down in, using the moki steps - or rappel from a block on the left rim. Into the Canyon!! The canyon gets going right away. It cuts into the stone, and there are many short downclimbs and narrow slots. Expect chimneying and strenuous sideways shuffling. After an hour or so, the canyon drops sharply, and two rappels of about 25 meters (80 feet) from chockstone anchors are made. You might get wet! The narrows continue, offering up a wide variety of views. If you're lucky, the light will make them sublime. A couple long sections of sideways-slanted narrows inflict pain on the over-prepared. Gloves will keep your hands from getting chewed up. Work your way through it, until suddenly you pop out in a bigger canyon. The final cliffband can be avoided by going left and working your way down the Kayenta ledges, or it can be rappelled directly - 2 - 80' rappels from chockstones in the canyon - probably easier. Walk about an hour downcanyon, and find the exit. Locating the exit is important to your health and well-being. 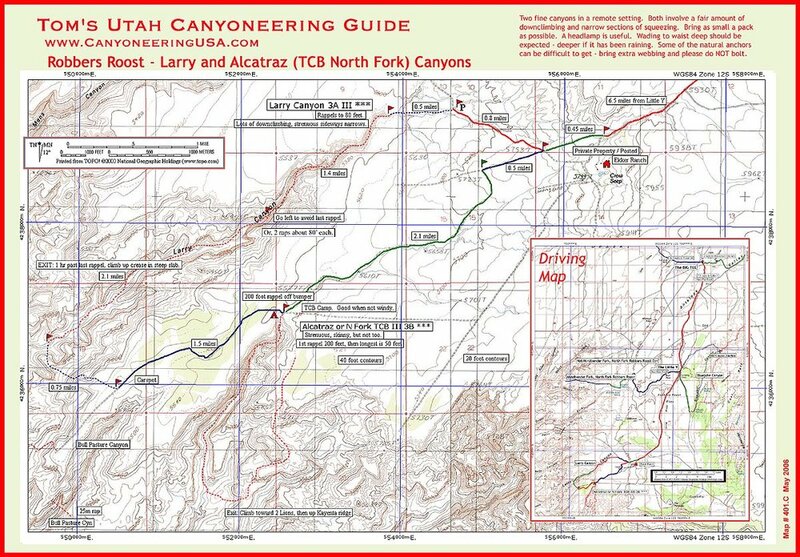 The difficulty is escaping from the lower gorge, and the exit is a low-angle groove on the south side of the canyon, just after a short sidecanyon comes in. Desert bighorn sheep use this to exit, and so can you. It is 4th class or 5.2 - somewhere in that range. From below in the canyon, it looks much steeper than it actually is. Stay in the crack all the way to the top. From the top of the first cliff band, pick your way up to the rim, and find the road. If you spotted a car, it should be somewhere along here. Otherwise, slog up the road to your vehicle. There are no trip reports for Larry Canyon at this time. Check back soon, or better yet, submit a report of your own!